Previewed at: Verona Cinemas, Paddington, Sydney, on 11 October 2017. “The casting in a film is almost more important than the technique.” - Martin Provost. 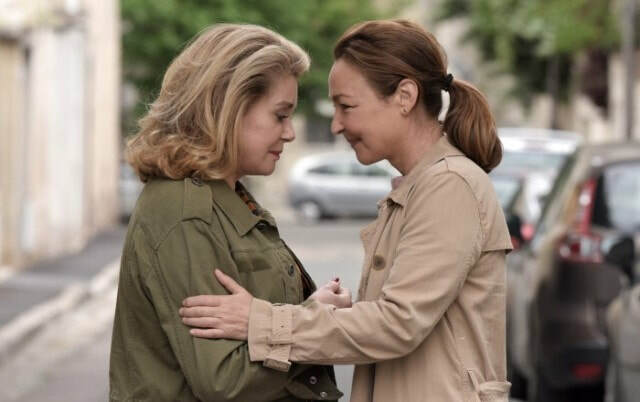 Catherine Deneuve and Catherine Frot are two of the best actors in French cinema and they are brought together on screen for the first time in Martin Provost’s superb film The Midwife. Add the great Olivier Gourmet into the mix plus a script written expressly for the three of them and, voila! you have the makings of a chef-d’oeuvre, a masterpiece. Set in Paris, this touching and at times funny film explores the need for people to reconcile when faced with something that is out of their control. In this case, it is the diagnosis of a brain cancer that brings the issue of forgiveness to the fore. Claire (Catherine Frot) is a midwife of the old school. The film clearly shows how sensitive and caring she is towards her patients, both the mothers and their babies. She’s been told that the practice she has worked in for years is closing but has been offered a job in another more modern clinic. She’s reluctant to accept, though, saying that it’s run like a “baby factory.” To add to the disruption, out-of-the-blue Claire receives a call from her father’s long-estranged mistress, Béatrice (Catherine Deneuve), a free spirit who wants to rekindle their lost relationship before she succumbs to the dreaded ‘ big C,’ but who’d walked out on Claire when she was a girl. Claire reluctantly agrees to meet and the two women attempt to unravel the secrets of the past. The pair are like ‘chalk and cheese’ however and Claire’s preferred loneliness is put even further to the test when she meets Paul (Olivier Gourmet), a long-distance truck driver who tries to bring some much needed joy into her life. The only person she regularly has contact with is her son, Simon (Quentin Dolmaire), who’s made the decision to quit his medical studies to become a midwife like his mother. All these changes upend Claire’s usual structured, routine life. The female leads are exceptional: Deneuve excels as the ex-mistress who has always lived life on the edge but who is desperate to make amends for abandoning Claire and having no contact with her for almost 30 years; Frot is equally impressive as a woman struggling to feel concern for a person who she regards as a deserter and yet whose basic instinct is to show compassion. As writer/director Provost says, “Claire and Béatrice are fundamentally opposed, but little by little, this contrast becomes a source of complementarity, of reciprocity, of wisdom” and his light touch doesn’t get in the way of these finely crafted depictions of the two women’s strengths and frailties. Gourmet is also an actor of great depth and his portrayal of Paul is enchanting. He makes him the kind of guy you’d like to have a vin rouge with.